With the publication of Grapes of the Hudson Valley and Other Cool Climate Regions of the United States and Canada, Stephen Casscles joins a small group of writers who have concentrated on winegrowing in the Eastern United States, including such august figures as Lucie Morton and Hudson Cattell as well as, most recently, Richard Fiegel. This book is a significant contribution to that literature and in important ways it is unique. First of all, it is organized in an unusual but sensible way. It begins as such books should by providing his interesting “A Short History” of winegrowing in the Hudson Valley, with a focus on the region’s hybridizers. It then proceeds to discuss the benefits of wine-grape hybridization, and then explores the basics of cool-climate viniculture. There is some excellent information and advice to be found in Chapter Three: “Basic Principles of Cool Climate Pruning and Vineyard Management,” including “10 Points to Consider When Cold-Weather Pruning,” an illustrated section on pruning methods and training systems, controlling disease in the vineyard, and a concluding section, “Additional Thoughts on Vineyard Management,” bearing on sod and sod management, mowing, under-canopy management, fertilizers, and earthworms. It pretty well covers the field. It is at Chapter Six, “Selected American Grape Species Used for Breeding,” that the organization then differs from all other such books of which I am aware. The following chapter is about Labrusca hybrids, followed by chapters on the Hudson Valley hybridizers, then the Early French hybridizers, the Late French ones, Geneva hybrids, Minnesota hybrids, Central European Vinifera and hybrid varieties, and closes with a chapter devoted to selected classic Vinifera varieties suitable for growing in the Hudson Region. Within each such chapter is a brief historical background followed by short biographies of each of the important hybridizers and then a detailed description of each significant grape of the related developer. “Selected American Grape Species” is an important contribution as it describes the leading native vines used for wine production (six species out of more than 70 that grow here): Vitis aestivalis and some of its vinous varieties; V. berlandieri (Texas and northern Mexico), V. cinerea (which favors rich soil along streams), V. labrusca (its varieties are among the best know, including Concord, Catawba, Niagara, and Delaware), and V. riparia (sometimes call River, Riverside, or Riverbank). Also included, partly by way of comparison, partly because it is now so widely planted in America, is the European species, V. vinifera. It then compares and explains the differences between the species, including their dominant habitats, geographical range, winter hardiness, and wine quality. This section is especially useful in helping understand the different varieties and hybrid that emanate from these species. For each variety of whatever provenance, the author provides a capsule statement, identifies the parentage, the typical harvest date (a range), and then displays five symbols: one for winter hardiness, another for disease resistance, a third for vine vigor, yet another for productivity, and the fifth for wine quality. Each is grade A to D. For example, Concord has a parentage of labrusca, should be harvested “mid-season to early late season” and its hardiness is A+, resistance is A, vigor is B, productivity is A+, and quality is rated B-. He does this for most of the 171 varieties listed in the index, though clones may be given more cursory treatment. Interestingly, Pinot Noir, that elusive Holy Grail of a variety, gets these ratings: hardiness is C-, resistance is D, vigor is C, productivity C+, and quality A+. But then, Concord is a Northeast native and Pinot Noir is from Burgundy, France. for Wine Quality, “Medium” receives a B, so the Concord’s B- means less than of medium quality. Discussion of the various grapes can be as long as two whole pages for Concord, as an example, though most get a far briefer treatment of a few hundred words. The vinifera grapes like Pinot Noir are extensively discussed. These variety notes focus largely on the viability of the vines in a region like that of the Hudson River and similar ones in Canada and the Northeast of the United States and other states like Wisconsin and Minnesota. For Casscles, winter hardiness and disease resistance are primary concerns, along with wine quality. Then the author explores the Early French Hybridizers (1875-1925) in a following chapter, including Bertille Seyve, Jr. (1895-1959) who created Seyval Blanc. Yet another chapter is given over to the Later French Hybridizers (1925-1955), of whom Ravat gave us the now widely-planted Vignoles and Jean-Louis Vidal provided Vidal Blanc, a mainstay of the East Coast wine industry. Next are the Geneva (NY) hybrids from the NY Agricultural Experiment Station located there, which bred Chardonel, Melody, and Traminette (one of this reviewer’s favorites). After that come the Minnesota hybrids, with Elmer Swenson (1913-2004) featured, along with his own interspecific crossings such as the excellent La Crescent, La Crosse, and St. Pepin. Casscles remarks on the attitude of Swenson, who had “a very generous policy of sharing breeding material and grape variety selections . . . to anyone who requested them.” This generosity is seen as a great benefit to growers, and in Casscles view, “This should be a lesson to many of our current university-based grape-breeding programs, which seem to want to control the products developed, but in doing so they limit the scope of the field research that can be done by not widely disseminating their plant material for comment.” An important point and one well-taken. In his thoroughness, Casscles also cover Central European Vinifera and Hybrid Grapes on pages 207-217, listing the German, Austrian, and Hungarian varieties that are suitable for planting in cold-climate regions. The final chapter is devoted to the leading vinifera varieties that can, despite disease pressure and severe winters, more or less thrive in the climates of the Hudson Valley and similar regions, including Chardonnay, Gewürztraminer, Riesling, Cabernet Franc, Gamay Noir, and Pinot Noir, including the latter’s many clones. Thus Casscles approaches his main theme, which is about hybrid grapes and the how and why of their development over the course of two centuries in both the United States and Europe. The book is also about a personal voyage by the author and members of his extended family, the history of which goes back to the Eighteenth Century in the Hudson Valley. This reviewer does have a grape of contention over a statement by the author that seems a bit misleading: “Running counter to the generally held belief of the Viniferists—especially those purists who would like limit production to a few “pure” classic vinifera grape varieties, such as Chardonnay, Cabernet Sauvignon, Riesling, or Pinot Noir—all grapes are hybrids. Even the mighty purebred vinifera Chardonnay is a naturally occurring hybrid of Pinot Noir and the bulk grape Gouais Blanc.” -p.20. However, this insistence that even intra-specific genetic mixing, whether occurring in nature or manmade, runs counter to the widely-accepted definition of Pinot Noir and Gouais Blanc is a cross, not a hybrid. Karen McNeil’s The Wine Bible defines a cross as “A grape created by fertilizing one variety with another variety of the same species. While a cross may result from breeding, most crosses occur spontaneously in nature. . . . A cross is not the same as a hybrid.” To wit, “As distinguished from a cross, a hybrid is a new grape variety developed by breeding two or more varieties from different species or subgenera. The most common hybrids are part European species (Vitis vinifera) and part any one of several American species.” However, Jancis Robinson’s Oxford Companion to Wine (3rd edition) does cut Casscles some slack: “cross or crossing, the result of breeding a new variety by crossing two vine varieties of the same species, usually the European vinifera species. Thus Müller-Thurgau, for example is a cross. Crosses are different from hybrids, sometimes called interspecific crosses, which contain the genes of more than one species of the Vitis species.” –p. 197. On the other hand, Casscles finds a couple of entries in Jancis Robinson, et al., Wine Grapes, regarding hybrid varieties are at times a tad off the mark. In his very extensive endnotes to each chapter he frequently cites Wine Grapes and where needed carefully provides corrections of that version. The book is well-illustrated with many black-and-white photos, drawings, and diagrams as well as a set of color plates of 27 different varieties. It has but two maps, one of fruit-growing areas of the Hudson Valley, and another of the hardiness zones of NY State, showing the zones from 3a to 6b, but without explanation of what the zones actually mean. The map is based on the USDA Agriculture Research Service NY Plant Hardiness Zone Map, but if one were to go online to the USDA Website a far more detailed Zone map shows the entire range of the zone system, which is based on the minimum temperature range for each zone. Thus, zone 3b has a minimum range of -35 to -30° F., while zone 6b ranges down to -5 to 0° F. Indeed, the online map doesn’t even refer to zone 3a, which would have a range below -35° F.
But these are mere quibbles when one considers the overall quality and detail of the information provided in Casscles’ book. It is a real accomplishment and deserves respectful attention, particular from growers, winemakers, and anyone who is determined to cultivate cold-weather varieties and make wine from them, not to speak of serious oenophiles of any persuasion. Apart from the excellent and extensive endnotes to each chapter there is also a substantial bibliography as well as an index to the individual varieties covered in the text as well as a general index. 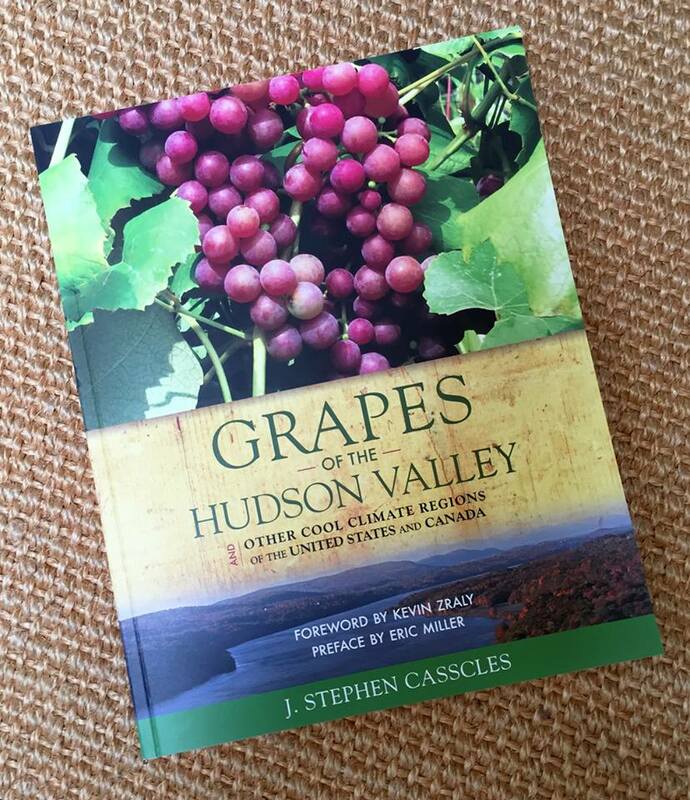 J. Stephen Casscles, Grapes of the Hudson Valley and Other Cool Climate Regions of the United States and Canada. Forward by Kevin Zraly, Preface by Eric Miller. Coxsackie, NY: Flint Mine Press, 2015. 266 pages, including the Introduction and Indices. Paperback, $29.99. Casscles has been a government attorney for the NY State Senate for the past 28 years, and has drafted at least 22 laws bearing on the wine and spirits industry, working with six State Senators over that period. He has been growing wine grapes at his farm in Athens, NY, since 1990. He is also the winemaker for the Hudson-Chatham Winery. This entry was posted in References, Vineyards, Viticulture and tagged Cedar Cliff Vineyard, cool climate grapes, Eric Miller, grape hybrids, Hudson River Region AVA, Hudson-Chatham Winery, Kevin Zraly, Stephen Casscles on 8 September 2015 by JoseM-L.
An excellent and well thought out review of this book. Stephen’s book is an exceptional addition to the burgeoning cannon of east coast wine books. And one that is filled with lots of information that will be helpful for generations. An excellent article, Jose!! !